In the year 2015 the restaurant interior underwent a new styling for purpose of adjusting to up-to-date trends and at the same time to retain its uniqueness. Beautiful views of the square with its famous “Lovers” fountain exponentiate the pleasant environment of the restaurant. The inner space offers friendly sitting in the boxes, which will provide you for privacy. The menu turns back to the traditional and long term successful specialities as Red deer medallions served with chestnut pure, Beef tenderloin steak served with cèpes sauce, Venison goulash or traditional Blackberry turnovers sprinkled by ground nuts. Besides these famous and well-known dishes, because of which you have come to us for a long time, we have replenished the menu by currently requested meals as: The largest fried pork chop in the city, pork cheeks stewed in wine or Apollo burger and many others. Besides à la carte offer you can choose from various good value menus at reasonable prices. On workdays you and your colleagues can enjoy the meals from our Daily lunch offer. Our Business Gourmet menu is worth trying, too. We offer this menu without any limiting and it is made from the most popular meals. If you don’t want to prepare your Sunday lunch yourself, take your family or friends to the Apollo. 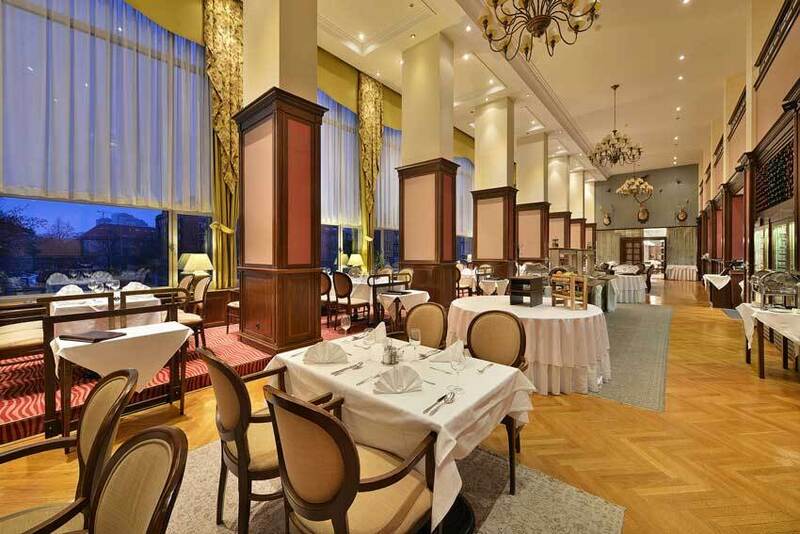 Located between the Old Town and Bratislava's business district, 1,500 m from the New Slovak National Theatre, the Apollo Hotel features a gourmet restaurant. All rooms were renovated in 2015, 2016 and 2017 and offer free WiFi. Eurovea Shopping Centre is a 15-minute walk away, as well as Danube. Hotel Blue Garni offers modern accommodation situated only steps away from the Apollo Business Center and the Eurovea Complex, with Bratislava's historical centre reachable within 2 km. This hotel is air-conditioned by a ceiling-cooling system, and free WiFi is available throughout. Rebel Live Show to je jedinečná Talkshow plná inšpiratívnych príbehov, zaujímavých osobností, skvelých hudobníkov a vína! Každá Talkshow vždy privíta jednu inšpiratívnu osobnosť a jej príbeh. Osobnosti ktoré osud postavil do pozícii v ktorých by sa nikto z nás nechcel ocitnúť, no i príbehy tých ktorí vyhrali nad sebou a dokázali svojou drinou veľké veci! Druhým hosťom v poradí je osobnosť ktorú môžete poznať či už z televíznej obrazovky, divadla alebo médii. Táto osobnosť Vám prinesie svoj príbeh, dávku humoru a odpovie na otázky na ktoré chcete poznať odpoveď. Celú show dotvára hudobný hosť ktorý počas celého večera bude dotvárať atmosféru svojim umením a unesie Vás pri pohári vína od každodenných starostí a problémov. Celým večerom Vás sprevádza moderátorka rádia Viva Kristína Jurčová! Tešíme sa na Vás ! Pozvanie prijali : Tomáš TOPA Stríž - dizajnér Bronislava Kováčiková - herečka Valér Ferko - moderátor Chris Ellys - spevák Na každého z Vás čaká WELCOME DRINK a MALÉ OBČERSTVENIE pretože pre nás ste všetci VIP ! ------------------------------- Podujatie je v rámci služby Predpredaj.sk dostupné len online (nie je dostupné v kamenných predajných miestach). Predpredaj.sk vám umožňuje online nákup vstupeniek na rôzne hudobné, kultúrne, športové a iné podujatia.